Americans spend around 37 minutes a day preparing food and cleaning up. If your kitchen feels cluttered, it can make you lose your space’s peaceful, homey feel — not to mention become a hazard. This is something I’ve dealt with in any apartment I’ve lived in. Between piling dishes, stray appliances and having almost no counter space, my kitchen used to drive me wild. Fortunately, simplifying your kitchen is relatively easy. You don’t have to purge your space, but a more minimalist lifestyle can help you make great strides in protecting your peace of mind. Look at all the appliances and little gadgets that sit on your countertops and fill your drawers. Do you only use that potato ricer once a year at Thanksgiving? Would the world end if your potatoes weren’t completely smooth? What about the food saver you just had to have but never use? Anything you don’t use often should either go into storage or be sold or given away. If there’s something you really can’t part with, find alternate storage. I love my waffle maker, so I saved some space by placing it and a few other items in a bin in my hall closet. It’s neat, it’s tucked away, and it’s not taking up space on my counter unless I need it. Stop buying the newest gadget the minute it hits the market. Sure, that microwavable boiled egg maker sounded like a great idea — until you realize the eggs are rubbery and it’s a pain to clean up. Avoid buying all the gadgets, and stick with reliable, multifunctional tools. Plus, make an effort to cut back on food waste. Expiring food not only looks and smells unpleasant, but it’s bad for your wallet too. Essentially, you’re throwing money away with poor planning and an unorganized pantry. Buy only what you need by making a list before you go to the store. Eat leftovers. Keep a few containers on hand to freeze meals for later dates. If your kitchen is small, it may seem tight even with less clutter. Think through the colors you’re using, and focus on design elements that draw the eye without being too busy, such as a pretty tile backsplash or artwork above the cabinets. Simple, natural colors for cabinets and counters create a soothing design without distraction. Use lighter colors to brighten up the space and create the illusion of a larger room. Also look at functional designs, such as adding places to hang oven mitts and towels to the inside of cabinet doors. Make sure you have enough space to work safely. One tip to avoid cutting yourself in the kitchen is to work on a stable surface. The clearer you can keep your counters, the more space you have for food prep. This helps you jump into cooking without shuffling items around — and reduces the risk of bumping a knife off the counter. In addition, getting rid of clutter allows you to stay on top of keeping counters and tools as clean as possible. Cleanliness offers great peace of mind, especially if you’re cooking for a family. More bacteria are in the kitchen than any other room in your home. The average kitchen drain has 567,845 bacteria. It takes only 10 bacteria to make someone sick. Keep your kitchen layout simple and uncluttered. If you don’t have a lot of space, a kitchen island isn’t a great idea, as it can make your kitchen seem small and confined. You can always add a rolling island when you have a lot of prep to do and tuck it away out of sight when it isn’t needed. An open floor plan is at the core of minimalistic design. If you’re a tenant like me, you might have limited options, but you can optimize the space you have with some clever organizational hacks that really open up the kitchen. Another feature of a minimalistic design is hiding appliances. Think about how you lay out your cabinets and if you can hide the refrigerator behind a cabinet door so that it blends almost seamlessly with the rest of the room. A convection cooktop can go right on your kitchen island, making it multifunctional. Think through how to integrate appliances so that they’re a natural part of your design. One study found that feeling out of control leads to overeating. Participants who felt “out of control” ate 103 more calories than those who felt in control. While there are multiple factors that can lead to this response, an easy way to help you maintain peace of mind at home is to start in your kitchen. 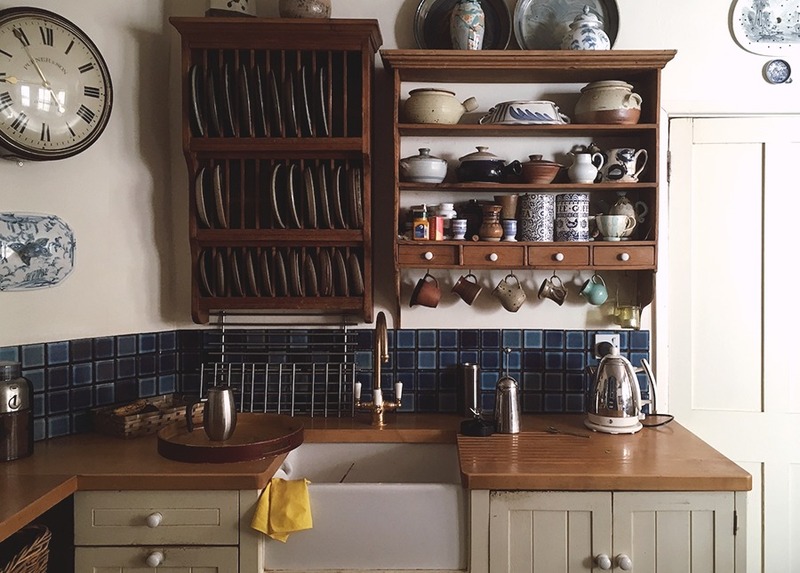 I often let my kitchen cleaning tasks pile up until I felt too stressed to even get started, so here are some simple rules I adopted: Start every day by making sure all dishes are out of your sink and put away. Create a place for everything. Wash dishes immediately after a meal. Plus, I’m far more likely to cook a healthy meal when my kitchen is already clean and ready to go. Adopting a more minimalist mindset has helped me take more control of what I’m eating. Our environments can impact our moods more than you might think. The kitchen is the source of so much activity in your home — implementing minimalist principles can make you feel calmer, help you save money, and keep your to-do list at a manageable length. A minimalist kitchen is sleek and tidy. Every element has a specific location. Counters are uncluttered, and everything is functional. The design is elegant and soothing. Try it out to see just how much it can improve your day-to-day life!